DarkLight posted this at 23:56 — 5th July 2015. Hi guys. I've been working on SongRepo for a while now, and I decided to get some feedback. The site is designed to accomplish its mission whilst being as simple and speedy as possible. Every line of code was written from the ground up to be as efficient as I can make it. It's true the site doesn't have all the bells and whistles normally associated with this type of project, but it makes up for it in reliability and speed. It gets its data from Last.FM and YouTube. Many many details to talk about but that's not why I'm here. I would like to have your thoughts on the design, most importantly. Be sure to go to the site and have a click around to get the full experience. As a fellow developer, you might appreciate the nature of the site and what it stands for. It's 'pure' and free of all distractions. Atleast, that's the idea. Let me know your thoughts. Something to be proud of, I think. Megan posted this at 13:37 — 6th July 2015. Nice to see you back, Reese! This is a lot better than the last time I saw it. It seems like you've done a lot of work. I think it would be a good idea to drop some of the special effects on the logo. A simple type treatment would look more modern. Same with the shadow and border around the edges of the page. Then darken the outer background a touch. The intro text mentions that you don't ever need to create an account, so I'm not sure why the top section of the left menu is login/register links. Those should be in a less prominent place. One big problem I found is that I can't go back to my search results after viewing a song - I just get a form resubmission notice and an error page. I think it would be important to get that working. DarkLight posted this at 16:46 — 6th July 2015. Hi Megan, thanks! Great to be back. A lot of what you mentioned has been playing on my mind. For example, the login/register links being so prominent when I state that it's not needed, and the POST submission on search results. I do need to get these things sorted. It's funny you should comment on the backdrop, because this is an addition I made only today to see what reaction I got. Not a very good one, all round, so I've removed it. If you refresh on the homepage now you will see the site as it is supposed to be. 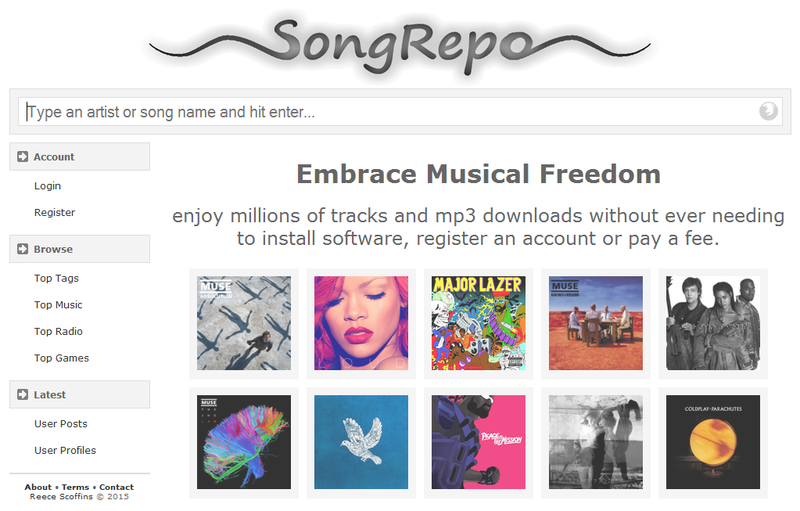 I just updated this thread to contain the GTmetrix Report for SongRepo. Thank you for a great review Many things you pointed out backed up my own suspicions, so I now have a few things to be working on. DarkLight posted this at 22:47 — 28th August 2015. Hi guys. A lot of changes have been made since the last post, so please take a look at the site now. You'll find it's much more interesting, and feels smoother to navigate. PreciousReed posted this at 18:40 — 11th May 2016. You can make the images of the album bigger like tiles design. Another point I want to make is make your website design responsive because it doesn't look good on devices with smaller screens like smartphones. DarkLight posted this at 00:40 — 24th July 2016. Thanks for the feedback A lot has changed since your visit, and one of the things I'm working on is a responsive design. It is a little better now, thanks to the auto-hidden/floating left menu, but not quite there yet.